We get the occasional email from readers asking about the cheapest way to get to Gatwick Airport. Learning how to get a discount on the Gatwick Express is totally different to saving money on Heathrow Express. There are no online discount codes or Gatwick Express promotional codes to share. What you do have are a variety of alternative train options to Gatwick, potentially saving over 50%. When I was living near Clapham Junction, Gatwick was my favourite airport to fly from. There are several trains an hour from Clapham Junction straight to Gatwick’s South Terminal and using your Oyster card, or a contactless credit or debit card, you can just rock up at the station and go straight to the platform. If you want to save a bit of time and are close to Victoria the Gatwick Express or Southern services are an alternative. You can also take the Thameslink from stations such as – Thameslink expansion construction permitting – West Hampstead, Kings Cross, Farringdon and Blackfriars. For readers not familiar with Gatwick, you need to understand the difference between the Heathrow and Gatwick Express services. The Heathrow Express runs, for the last part of its journey, on a dedicated piece of track paid for by Heathrow Airport itself. Only Heathrow Express and Heathrow Connect services use this track, and the airport is free to charge what it likes to use it. Gatwick Airport, on the other hand, sits on the normal rail line from London into Brighton. 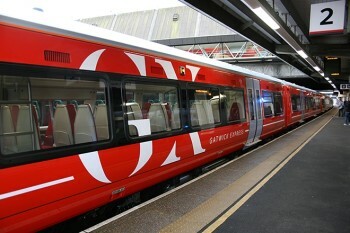 The Gatwick Express is only one of several train services to use the station. Whilst the most expensive, it is only marginally the fastest and – for many people – its terminus at Victoria may not even be very convenient. The station at Gatwick is based in the South Terminal, now home to British Airways. If you are going to or from the North Terminal, mainly used by easyJet, you need to change for the 3-minute ride on the transit train. Here is a comparison of the different train companies using Gatwick. Frequencies are based on Monday to Friday services. Note that children under 5 do not require a ticket on any UK train service. The bottom line, though, is that the key to saving money on the Gatwick Express is to not take the Gatwick Express! Train tickets on other routes are available for as little as £8.10 per person each-way as we will see. For a larger group, the premium for the Gatwick Express is less steep if you buy one of the ‘group save’ tickets above. If you want to commit in advance to a specific train, tickets can be pre-booked online for £12 each way. But unless you don’t have an Oyster or contactless payment card (and it’s worth getting one simply to use the train to Gatwick) I wouldn’t bother pre-booking a train as you would need to buy a new ticket if you missed your train. As far as Oyster pricing is concerned, peak hours are Monday to Friday from 06.30 to 09.30 and from 16.00 to 19.00. In theory, Southern sell a handful of £5 Advanced Purchase one-way tickets to Gatwick on each train. These are difficult to get, however – they tend to appear at random 4-6 weeks before travel even though they are meant to be available 12 weeks in advance. It is worth checking for these but prepare to be disappointed. 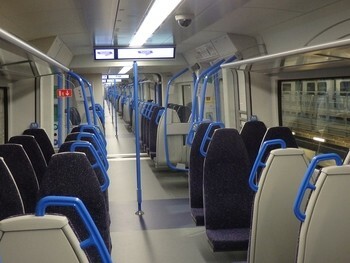 The majority of Thameslink services to Gatwick are now operated by the new 700 series trains. These are air-conditioned and have more luggage space. The picture below is of a standard class carriage – First Class is also 2×2 seating but has tables and power sockets. One First Class carriage is often declassified and standard class passengers can use it. For all of these services, it may make sense to buy a Network Railcard if you will be taking a number of National Rail trips. The card costs £30, is valid for a year, and offers 1/3 off for up to four adults and 60% off for up to four children (if travelling together). The only restriction is that it cannot be used before 10am Monday to Friday. With Oyster and contactless cards being accepted on Southern Railway as well as the Thameslink all the way to Gatwick, I can’t find a reason why you should pay for a paper ticket unless you have a Railcard. Historically, Gatwick Express trains had improved luggage space and marginally better seating than most trains. These days, you will often find a regular commuter train running the service so these benefits will not necessarily materialise. More importantly, at peak hours Gatwick Express trains often run to and from Brighton. This means that there will not be a train waiting at the Gatwick platform to board immediately and it may be full when it arrives at Gatwick. It is important to note that the ticket machines at the airport station are owned by Gatwick Express. They are therefore programmed to prioritise Gatwick Express tickets, and you may need to work through a number of screens to find tickets from Southern or Thameslink. You don’t need to worry about the ticket machines if using Oyster or a contactless payment card of course – just touch in at the gate. Which is better - the Lloyds Avios Rewards upgrade voucher or the BAPP Amex 241? Is the oyster payment something recent? tried once a couple years ago , arrived in Gatwick and had to paid penalty for not having a ticket. While my oyster was charged the uncomplete travel fee. Moreover, I heard that there is a loophole in the system when you are allowed to travel on Oyster with minimal (let’s say 0.10 balance) to Gatwick. You can then ditch your Oyster card with a £5 deposit on that – this is your ‘fare’. Wouldn’t recommend to repeat this but technically it’s possible. Are they still available? They were in the old version of this article but I thought they had gone. Will have a deeper dig later. EDIT: No, seem to have gone. Can’t find anything even booking 80 days in advance. They are, but Southern likes to play with availability. In theory, there should be £5.00 tickets on their own site (but not any other rail discount site) from 12 weeks ahead. But during school holidays and weekends, they often don’t put up the Advance tickets until 4-6 weeks ahead to encourage people to buy the more expensive tickets earlier. Rob, if you have registered your oyster card with TFL, and you have a railcard (eg gold card season ticket, network railcard or friends and family/young persons rail card) you can go to any TFL ticket booth and get them to “load” the railcard into your oyster so the 30% savings on off peal travel are automatically applied. It’s not all railcards that can be loaded onto oyster fir a discount on off peak fares. I thought the 30% discount when loading railcard onto oyster card was only for tube journeys and not for rail journeys using oyster? And if you start your Southern journey outside central London the journey can be even cheaper – £6.60 from Peckham on Monday morning. Quicker than by car too. It’s also not always cheaper to use Oyster to travel from outside zone 1. From Canada Water to Gatwick down the East London Line, changing at Norwood Junction, the paper ticket is £9.60 and there doesn’t seem to be a peak/off-peak price. So if you’re traveling during peak times it’ll save a couple of pounds to use a paper ticket over Oyster (off-peak £8.10/peak £11.60). If I am not flying to Heathrow, I take the East Coast Mainline which terminates at Kings Cross and connects with the Picadilly line to Heathrow. The extra add-on for a through ticket is a couple of Pounds. Splitting your journey at East Croydon can save a few quid. Ie. You want to go to LB but the next train that comes is to Victoria. Get on the Victoria train and off at EC. Touch out and back in then take the next train to LB. You’ve not lost any time but saved some money. I’ve been doing this too but always use two different Amex cards. Do we know what the system charges if you use the same card? You get the cheaper fare even when using the same card, I do it all the time with half a second between touching out then back in. Yep, I think there’s a minimum time you have to wait outside the barriers or it will treat it as the same journey. I read somewhere that the workaround is to go to the bus stop outside the station, touch onto a bus and immediately get off again. Depending on your route, the £1.50 bus fare is still less than the train saving by splitting your journey. But 2 separate contactless cards sounds easier! I prefer to let wild horses drag me to Gatwick. Takes a bit longer but at least you save a few quid on the train fare. Continuation exit mode is used at stations where there are separate gatelines for different parts of the station (such as rail and tube, or different rail lines), so that a cheaper through fare can be charged rather than separate fares for each leg of the journey. It gives you e.g. 40 minutes to find your way to the train platform at Kings Cross when you get off the tube there. Breaking an OSI is rarely useful except in limited circumstances where you have a travelcard but the default route includes an extra zone or on some of the odd Greater Anglia fares. 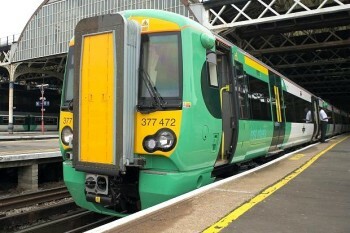 **East Croydon may have OSIs set if there are bus replacements on the Brighton Main Line. By using 2 cards you may miss out on the daily cap or Mon-Sun cap. I’ve always just used the same card. Just checked the numbers and it saves £3.90 peak and £1.80 off peak. I had cause to travel Heathrow to Gatwick a couple of weeks ago. £1.50 for the X26 to Croydon, and £3 for the onward train. Coming from the South-West of England, I travel with National Express from Exeter ( where I live nearby ) for about 7 – 9 £ depends on the time of the day. The buses are all on a route with the airports, either before or after Victoria Station, so you can go off in Heathrow for example without even travelling into London. Then there are buses from the Airports for about 2 £ if you want to go into London to visit friends and stay overnight in their place. You need to book them online in advance, every bus from Exeter and all others too. Some come in bundle with your airport ticket. Since then I don’t think about trains, and I am good served being in 2.5 hours from Exeter in Heathrow or in 4 hours in Victoria Station. Agree, depending where you live south of the river the National Express A3 can be a pretty good option. From Vauxhall it takes about an hour and and a half and tickets costs between £5 and £10 – particularly good if you are travelling in the middle of the night or if you live particularly close to one of the pick up points. The route is Victoria – Vauxhall Park – Stockwell – Streatham – Mithcam – Rosehill – Sutton. Ah Gatwick bane of my daily commute. You can save money by using the usual Southern trains but they are invariably packed at all times of the day. There are many many points when you will not get a seat travelling into London. I do often marvel at the name Gatwick Express because it genuinely is no faster. However in my vast experience of the Brighton to London termini routes I have to say the Gatwick Express is the least unpleasant option from a comfort perspective. You just have to hope that the trains are actually running, but to be fair the industrial action situation has been much better this summer. If you are using a contactless card how does it know if you have used Gatwick Express or Southern? Surely you have just touched in at the stations so it won’t know which train you used? I believe they have special Oyster readers on the ticket gates to the platforms used by Gatwick Express that charge you the “premium” fare. ‘cheat’ this as the platforms are not connected “airside” so you have to exit the same way. Problem is sometimes Southern trains use the Gatwick Express platforms at Victoria. The staff are supposed to open the access to another gate, but if you don’t know what is going on then you might go out the wrong way and be charged the premium. On my last journey from Victoria to Gatwick, I had a Southern Railways ticket and I took the correct tran, but the coaches had “Gatwick Express ” emblazoned on the outside. Very confusing for visitors . I spend the entire journey worrying I was going to be busted for travelling on the wrong train. As the article says, the guard was nowhere to be seen. In my student days, 20 plus years ago, it was cheaper to buy a Victoria to Three Bridges ticket, Three Bridges being further than Gatwick. To clarify the “One First Class carriage is often declassified and standard class passengers can use it” about the Thameslink 700’s, it’s always the rear first class, and it’s always declassified. Good if you want a plug socket and a slightly more comfortable seat. Rear from London or rear in both directions? Rear as in direction of travel. And Londoners claim they are not subsidised 🙂 .